It is time to Punch! 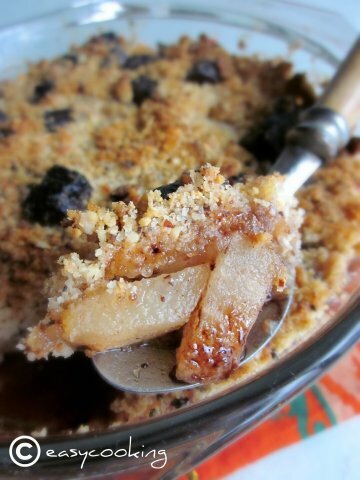 !Yes,our December Punch is here again and I am happy to be hosting it this time.Our challenge was a Crumble/Cobbler this month and I chose a Pear,Chocolate and Almond Crumble. Few months back,I didn't know what a crumble was and now I am a convert.I love the flavor of caramelized fruits topped with the delicious crumble topping.I have tried an Apple Crumble version here.This recipe is almost similar but with a slight twist.Chocolate makes anything better,so I believe and it is true in this Crumble too.Little bites of chocolate in between crunchy crumble and soft pears,absolute YUM!! Grease an oven proof glass dish or a pie dish or individual ramekins. 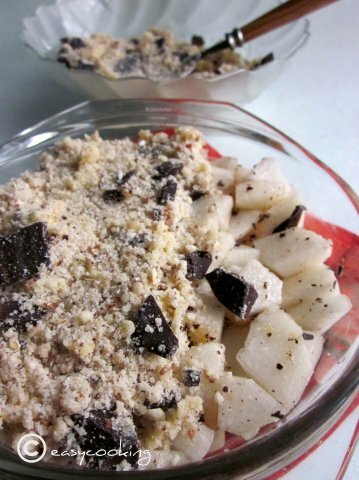 In a medium bowl, mix together the pears,sugar, lemon zest and juice, and half the chocolate. Divide the mixture between the glass dish or ramekins, spooning over any juice. To make the crumble, place the flour and butter in a medium bowl and, with your fingertips, rub together until the mixture resembles fine breadcrumbs. Stir in the sugar, almonds and remaining chocolate. 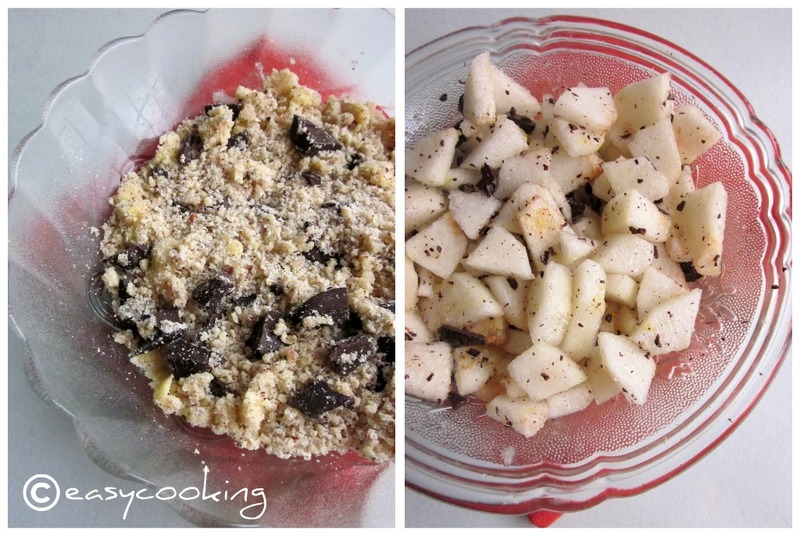 Spoon the crumble over the pears and press down lightly. Place the crumbles on a baking tray and bake for 30-35 minutes until golden and bubbling. So tempting to see the browned crispy top! Lovely! woo this is somthing new dish...very healthy indeed..
That looks very good! Thanks for choosing this recipe, Divya! Nice browned crispy topping. ; i am tempted again. That is one pretty crumble! 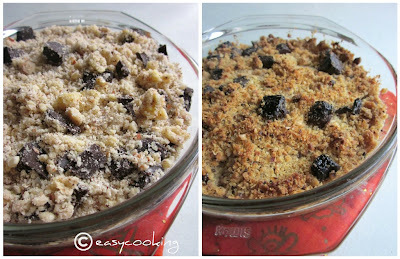 love the little chocolate pieces peeking above the crumble! Yumm!! 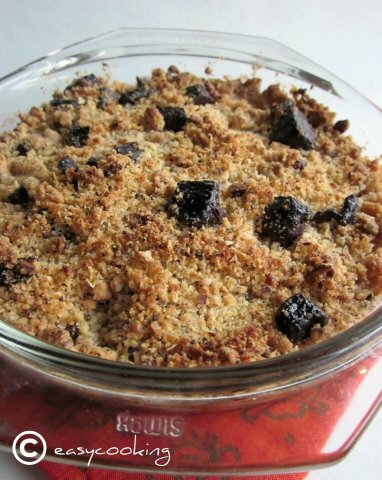 wat a beautiful looking crumble..
thats very tempting !! lov the pics! The host makes it best! Your crumble looks perfectly baked. Thanks for choosing this Divya! Crumble looks delicious with those chocolate in there! This dish looks so tempting and delicious! Love the golden brown topping! Hi Divya, came across your blog through the sweet punch site, which I came across thru Nag's edible garden...looking thru your blog now and loving the recipes...just wanted to know how do I contribute to the sweet punch event this month? Do I link to you or to sweet punch? Crumble looks gorgeous..Thanks for sharing..